Peterborough United defender Gaby Zakuani will leave London Road with a heavy heart after the Christmas fixture with Doncaster. 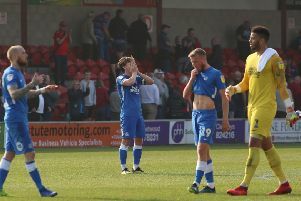 The central defender is always torn between his commitment to his country and his love of Posh and those feelings are particularly acute rught now. Zakuani is thrilled to be going to the African Cup of Nations with DR Congo in January, but gutted that he’s leaving behind a Posh side struggling for form in League One. “Just when I get the settled run of games in the side that I’ve wanted all season, I have to leave again,” Zakuani stated. “It’s frustrating because I want to help Posh get back into the play-off places, but it’s always a great honour for me to play for my country especially in such a big competition. Zakuani has started just six League One matches for Posh this season, but that includes the last four games. He’s struggled for his best form this season and readily admits a stop-start campaign full of injuries and international call-ups hasn’t helped. But he’s confident that when he returns from international duty, Posh will be in decent shape. “Our form is slowly coming back,” Zakuani added. “We just didn’t compete when we lost to Bristol City last month, but we pushed another top side like Preston all the way last weekend. “We were the only team that looked like scoring in the last 25 minutes of the game and that was encouraging. “If we keep that level of performance and effort up we will soon start winning games. We just need a bit of luck to get us going again. “The two games over Christmas are hugely important to us. If we can four or six point it will set us up nicely for the second-half of the season. “It won’t be easy as Chesterfield are going well and Doncaster have an experienced side with a good record away from home. When Zakuani is away in January it’s likely manager Darren Ferguson will replace him with Michael Bostwick rather than Ricardo Santos, although Zakuani wouldn’t be surprised if Posh try and bring in a defender on loan as soon as the transfer window opens.